A few months back, I had the honor of sharing a guest post for Joy of Joylicious blog on her birthday. She is one talented lady, so I was delighted and not a bit surprised when many of you were as excited to discover her as I was to introduce her. There's been plenty of fabulous stuff going on since then over at Joylicious, ranging from a website redesign to irresistible new recipes like these honey yogurt berry popsicles. 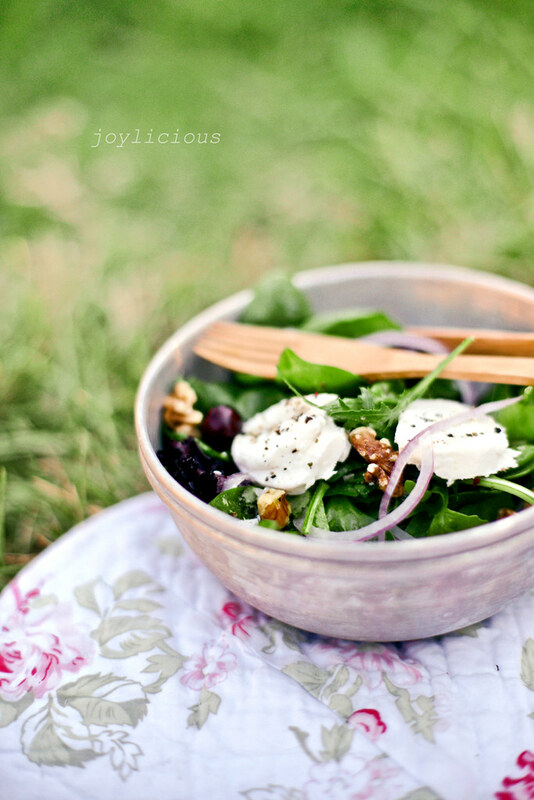 But being the sweetheart she is, Joy still took the time to make us a lovely picnic-worthy summer salad. And here to tell you all about it, I present to you my good friend, Joy! I met Xiaolu this year through the wonderful World of blogging. I was initially attracted to her jaw-dropping photos on 6 Bittersweets and with time have discovered that her inner beauty was just as beautiful as her talent. She was sweet enough to bake me cupcakes on my birthday and even mailed me the adorable pompoms she used to decorate them with. See why I love this girl? You’re the sweetest Xiaolu, thank you for having me guest post on your blog today. When I was a little girl, my family loved going on picnics. My fondest memories were of us laying a big blanket across the softest patch of earth we could find. Dad would carry the large cooler of food, Mom trotting along with miscellaneous bags of “stuff”, and I’d follow clumsily behind lugging a Sprite bottle half the size of my body (at the time.) We’d sit there enjoying chive dumplings dipped in chili oil, drunken chicken with ginger and scallions, boiled peanuts, marinated beancurd – what? You thought I was going to say, sandwiches and potato salad? Laying there for hours, we’d talk about our hopes and dreams, laugh about memories of our families back home. We’d play card games that mostly involved math because dad said my math skills were subpar at best. But it was still fun, promise =). And we’d always end our picnics with my favorite part. The food would be packed up, trash thrown away, and when there was nothing else left except for the blanket on the ground I’d lay in the middle of it. Mom and dad would grab opposite ends of the blanket and with a slick flick of their wrists they’d fling me up to the sky. I’d fly up so-high that I’d be only inches away from the clouds. Closing my eyes, embracing my weightless moments in the air, laughing so hard my stomach would hurt as tears streamed down my face. Though I’m no longer small enough to be thrown into oblivion, I still very much love my picnics. With Summers being blistering hot, the only thing that I feel good eating are salads. They’re light, easy to prepare and most certainly healthy. 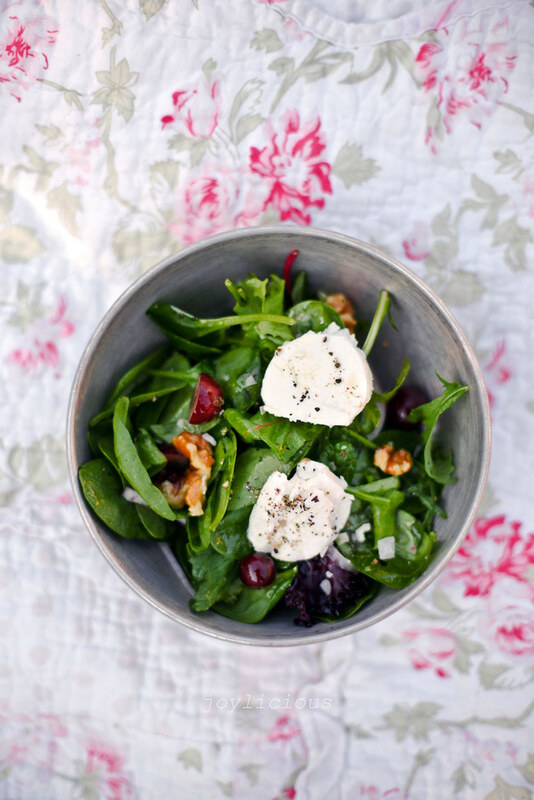 This recipe would be perfect for picnics – Summer Greens with Tart Cherries, Goat Cheese and Walnuts. Dress the salad when you’re ready to eat to ensure the best results. In a large bowl mix greens, grapes, onion, and walnuts together. Drizzle generously with olive oil and top with salt and pepper. Top with goat cheese slices (1 oz. per serving) and serve immediately. 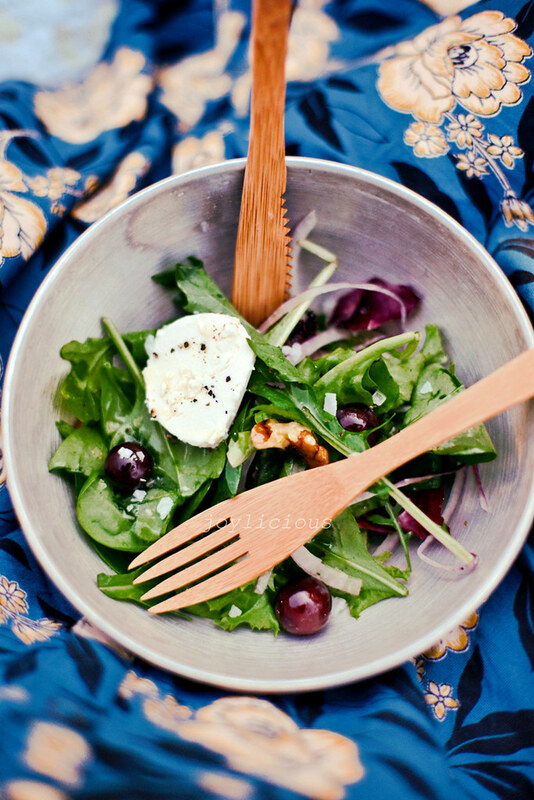 A beautiful salad and guest post! So colorful and fresh looking. I love the pairing of goat cheese and just about any fruit. I've had it with strawberries, peaches, but never grapes. It looks like a good combo! And your photos are gorgeous! Love Joy and her work! And what beautiful picnic memmories you have! I wouldn't mind being thrown up in the air till I reach the clouds! Hey Xiaolu, this salad is looking rocking. Loved the vibrant and fresh green color of the mixed greens bowl and addition of grapes is awesome. I love tossing grapes in the salad. Have a great week. Thanks n regards, sonia !!! Lovely salad and guest post! I love how this dish is infused with so many memories and so much love! A perfect summer salad! Lovely salad and a delightful mix of flavors. so beautiful! Love Joy's work. Pictures are amazing .. love the salad. Happy to have found your blog. First time here and following you. The grapes in this are an awesome idea. The photos are beautiful too! Love your food photography btw, great job ! Beautiful! That is a perfect summer salad!! Beautiful photos....and this salad looks beyond delicious. Xiaolu, you have some most amazing guest posts here! Beautiful photos and recipe. I have red grapes in my fridge that everyone is tired of eating as it is. I'm going to convert those grapes into this beautiful salad tomorrow dinner. I gotta get good goat cheese. My husband and I are not big fan of goat cheese but we've been trying out different recipes with it. Can't wait to try it! xiaolu, how i've missed you! i seriously fell off of the world wide web for a while. getting back to life now. thx for the guest post! i've started to love goat cheese more...i can't have one big bite of it, but I do like that they have goat cheese crumbles now so I get a little in every bite, but not a whole marshmallow of it. Thanks for sharing! I so enjoy picnic and casual lunch in the park . 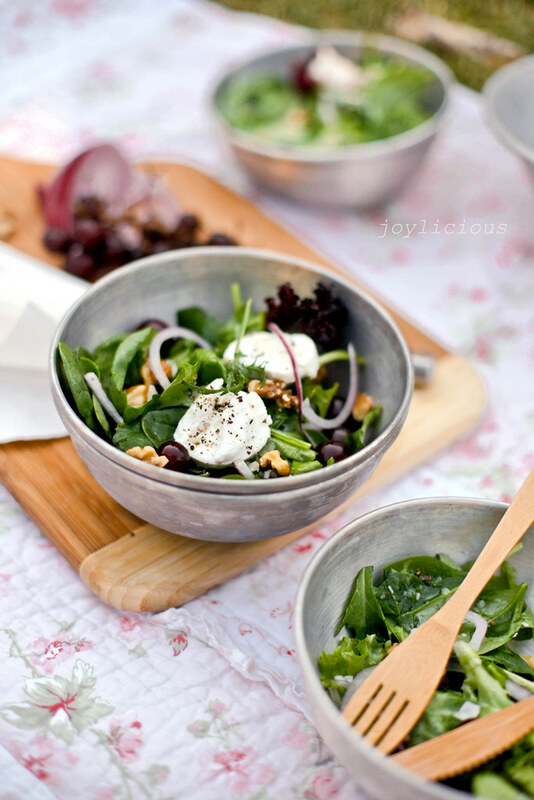 I don't like goat cheese much but these salad is tempting me and Joy's photo is always so joyful. LOVE, love the first photo! That salad sounds so refreshing!!! Thanks everyone! I'm glad you're enjoying Joy's post as much as I did. For the people are giving me credit for the photos, please know that it is all Joy and you should check out her site for more! Gorgeous post Joy as always! Love all the colors and freshness in the recipe..would like to munch upon this salad any time. Wonderful guest post, Xiaolu. This is a wonderful post. I love the way the food looks. Delicious. Great photos too. I've never considered putting grapes in salad, but you're right, the sweetness would be magnificent against the deliciousness of goat's cheese! !